On a cloudy chilly day with little time to spare on my break from work, I visited the museum for a quick look at the happenings of the day. 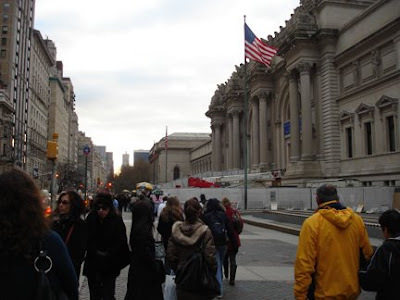 I had forgotten that today is the Saturday after Thanksgiving, but was quickly reminded by the crowd bustling about the Metropolitan Museum of Art. Surely the Met is a must-see for anyone visiting New York (it's on every "Things to do in New York" list — and rightly so). 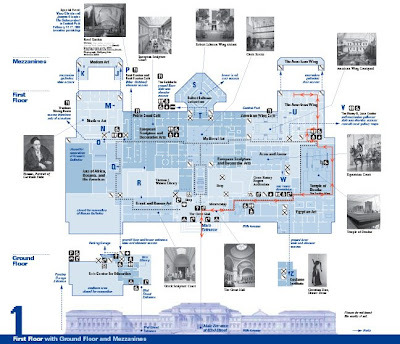 The swarms of visitors come from all walks of life, from dozens of countries; and they speak many different languages — in fact, the Met offers tours in Spanish, French, Italian, Portugese, German, Russian, Korean and Japanese. The more than three million works of art that reside in the Met are cultural artifacts created all over the world throughout the history of civilization; and the museum's visitors are the progeny of generations of ancestors interconnected in the collections at the Metropolitan Museum of Art. It's astonishing, really. 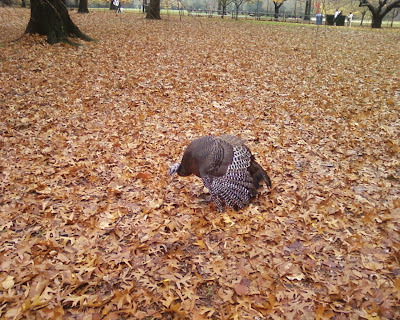 And now for a nice little Thanksgiving surprise: just the other day, I saw a wild turkey in Central Park on my way home from the museum! 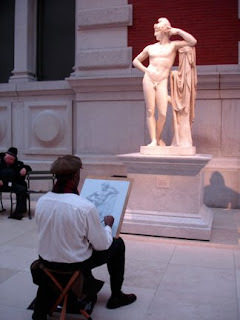 The Metropolitan Museum of Art is closed today, so not much to write. Perhaps a little background story: I can honestly say that the Met was actually one of the reasons I decided to move to New York City. I figured that if I ever got bored or lonely, I could always visit my favorite works by every great artist that ever lived. I was lucky enough to find a place just on the other side of the park, where I could easily walk or ride the bus to my favorite place in the world. Every time I visited the museum, I'd say "I could definitely live here!' 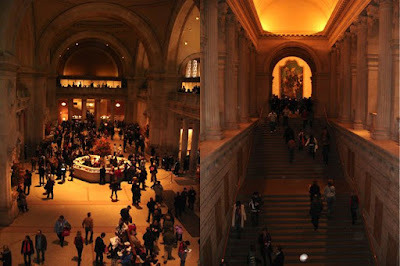 and one day the idea occurred to me that I could go to the Met everyday. Since the Costume Institute does not currently have an exhibition at the Met, it has instead created a tour called The Art of Dress, which highlights the clothing worn in paintings by the great masters. 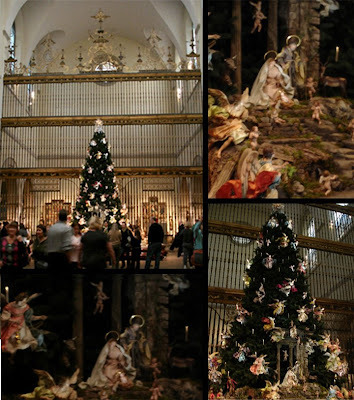 The Christmas tree and Neapolitan Creche were unveiled today in the Medieval Art wing. With the eighteenth-century Spanish choir screen as its backdrop, the tree stands proudly, adorned with tiny electric candles and dozens of angels in colorful flowing robes. Surrounding the tree is a miniature scene depicting every detail of the Nativity story, including the Three Kings (or Wise Men), all the choirs of angels, shepherds, animals, even an Indian prince! This might be the greatest discovery since I started this project: a 1983 Sesame Street video that takes place at the Met! Below is the first of eight parts from youtube. Click here to see the rest of the segments. In the spirit of spontaneity (on which this blog has been based so far), I decided to visit a gorgeous Art Nouveau poster that a friend mentioned to me yesterday. 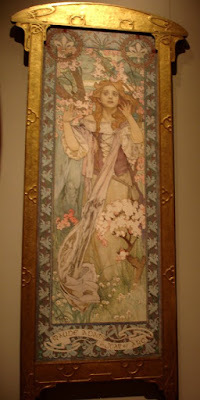 Located just outside the beautiful Wisteria Library, Maude Adams as Joan of Arc, by Alphonse Mucha stands out stylistically in the 19th- and 20th-Century European Paintings gallery. The movement spanned the gamut of creative and decorative arts including architecture, furniture design, interior decoration, graphic design and fine arts. Coincidentally, the work of Louis Comfort Tiffany (from yesterday's post) is also considered to be of the Art Nouveau style. The other day, while I was wandering through the American Wing, I briefly skimmed the Tiffany room and vowed to return soon. So today, with very little time to spare, I headed straight for the little space at very end of the wing that is currently open where the museum's Louis Comfort Tiffany collection is held. 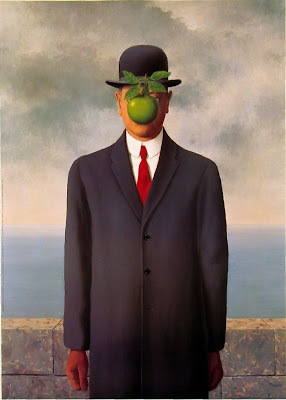 Today is Belgian Surrealist painter René Magritte's birthday (thank you, Google). Most famous for his painting Son of Man, seen above (but unfortunately not located at the Met), Magritte joined contemporaries like Salvador Dalí, Joan Miró, Max Ernst and Man Ray in depicting the subconcious and other psychopoetic subject matter. Surrealism first emerged as an intellectual and political movement influenced by the breakthrough ideas of the time; namely, psychological theories and dream studies of Sigmund Freud and the political ideas of Karl Marx. I decided to celebrate by visiting The Eternally Obvious, the only Magritte painting currently on display at the Metropolitan Museum of Art. It hangs in a room with colorful, surrealist paintings by Miró, Dalí, Braque and Picasso, and it stands out because of its more "realistic" style. The figure is painted accurately, segmented in gold frames and arranged on what would approximately be the correct place on the body. Not only does it stand out in with its style, but also because it is perhaps one of the most provocative works in the Modern Art collection (a tall order). I overheard two girls say, "That's interesting/That's disgusting! That's not even...," her voice trailing off. Perhaps it was the pubic hair placed at eye level that repulsed her. Anyway, it was then that I decided to sit and observe other people looking at it. In the fifteen or so minutes I sat there, the painting caught several people's attention, provoking smiles from some, scoffs from others. Some didn't want to look but I caught them do a double-take, while others stopped to read the caption. A school group came through and two boys about eight years old giggled as they looked up at it and said, "Is that hair? Oh my god!" Below is a slideshow of a few observers. After checking out the Petrie Court Cafe's menu and walking through more European Decorative Arts, I ended up at the far end of the Greek and Roman Sculpture gallery where I again sat down and cracked open my book. A leisurely day, but very pleasant — I really could live here. Today I took the Impressionism and Post-Impressionism tour. I have always loved Impressionism — the works of Van Gogh and Monet were most aesthetically pleasing to me, and Degas' ballerinas were my absolute favorite for a long time. The tour was enlightening, as the guide focused on the structure of the paintings — a factor central to the Impressionist movement. 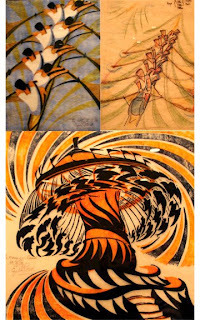 The drift from traditional practices wasn't just in brush stroke and realism alone, but also included a shift from the triangular structure with a single, centered focal point, to a more dynamic one. Impressionists organized their compositions with converging elements giving emphasis to several places on the canvas and sometimes off. Okay, these first two pictures are not Modern Art, but I'll get to it, I promise. 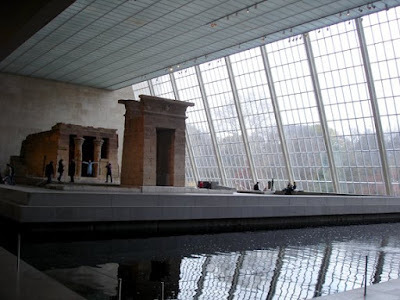 I arrived at the Met a little bit early for my 3:00 Modern Art tour, so I found myself gravitating toward the Egyptian Wing — in fact, I made a beeline for the Sackler Wing and the Temple of Dendur. 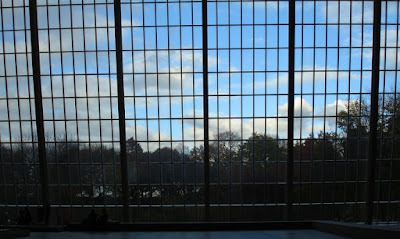 There I sat across from the windows, looking out at the clouds hovering over the autumn colored trees in Central Park. So relaxing. On to the day's business: Modern Art. 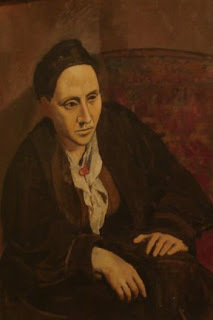 We began with a portrait of Gertrude Stein by Pablo Picasso, painted when the artist was only twenty-four. The significance of this painting is its obvious shift from realism to abstract in the subject's face. Instead of representing Stein's face as at appeared visually (of which he was perfectly capable), Picasso struggled to express her intelligent, contemplative, character through her facial features. 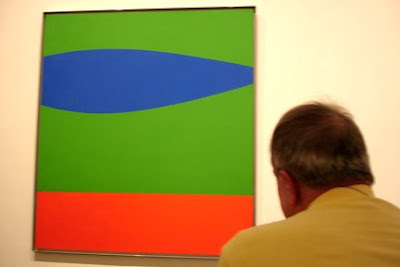 The change in intention, from simply representing things as they look to expressing a feeling or idea, marks the beginning of the Modern Art movement. Next, we turned directly the left to examine a painting by Henri Matisse. His use of bright, flat colors and lack of detail were revolutionary at the time, but the most interesting thing about this piece is that it is actually a painting within a painting. The subject is Matisse's studio, and the dancers are actually part of a mural that was leaning against the wall while he painted this. Notice the back leg of the stool lands inside the green field of the mural. 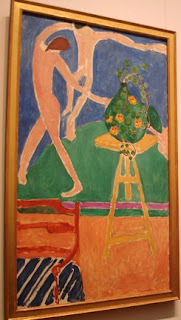 Matisse cleverly eliminated reality with this detail. Jackson Pollock is probably the most popularly misunderstood artist (in my experience alone, I've heard heavy criticism). Some people just glance at his work and proclaim that anyone could do that, that it's ugly, that it couldn't possibly represent anything. But, for me, especially after this tour, Pollock's work represents everything that goes on inside the mind. 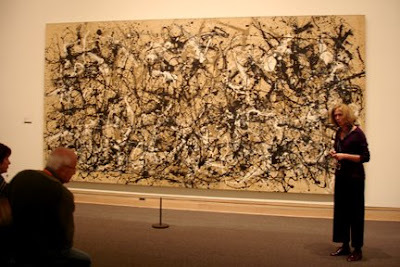 Not everyone could do that and make it look the way Pollock did — otherwise the copycats would be just as famous. While I sat looking at the canvas, the paint began to vibrate, to come toward me, to move around, interacting with itself. It's one of those "had to be there moments," it was magical. Next up: Rothko. 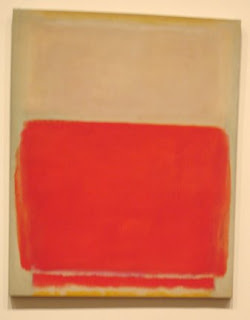 I know by now that a highly recognized modern artist is significant for a reason, but I hadn't taken the time to find out why Rothko made the ranks. His work isn't inherently interesting or even visually pleasing, but just one explanation by our tour guide had me convinced that he earned his status. Rothko's work represents universal human emotions — he was influenced by Carl Jung, and (at least in this particular painting) his subject was man's futile and tragic quest for immortality (according to our guide). When you look at the blocks of color, the red jumps forward at you, while the white fades to the back; the yellows at the top and bottom and even the the darker left and right edges contain the color within the painting. The fact that the artist intentionally laid the color on the canvas in such a way so as to express his feelings and ideas is itself the importance of the work. Ellsworth Kelly depicted reality, purged of detail, form and dimension. From his bird watching hobby as a youth, Kelly became interested in the way we perceive things as fragments (referring to the frame of binoculars) and as flat color (which, apparently can be done with a certain bird watching tool). 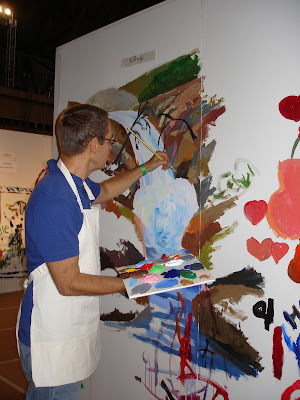 He said "my paintings are fragments of the visual world without the third dimension." This piece by Donald Judd explores the idea of self-referential minimalism. The identical boxes are the subject, referring to their subtle differences as visual contrasts. I particularly enjoyed the interplay of shadows below. I'll end with this work by Joel Shapiro. Its construction teeters at the edge of impossibility, as it appears off-balance. 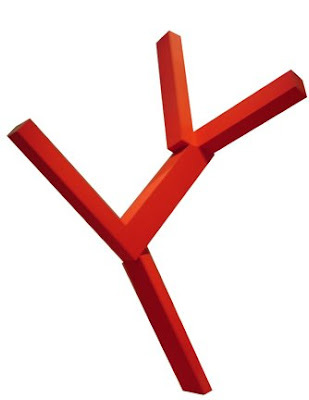 The sculpture is made of aluminum painted red, but when you look up close, it has the texture of wood. 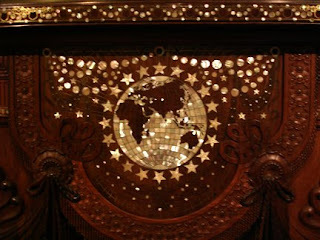 It's amazing, really, it actually shows no indication that it is not made of wood. Shapiro intended to create this contradiction to represent his fear that the organic would become robotic — that man, obsessed with machinery, would one day be replaced by his invention. As a child of the late 20th century, it is hard for me to grasp the fact that the idea of abstract expression was INVENTED in the last century. With a graphic design background, I have grown to greatly appreciate Modern Art for the mysterious feelings and ideas hidden in the canvases, sculptures and sometimes sharks in formaldehyde solution (The Physical Impossibility of Death in the Mind of Someone Living by Damien Hirst is intriguing to me, I'm sure I'll visit that in a post soon). In conclusion, though it is sometimes incredibly simple, sometimes ridiculous, sometimes ugly, Modern Art is what it is because nobody thought to do it before, it carries so much meaning and intent that it is difficult not to appreciate it. The whimsical sculptures captured my deep admiration the first time I laid eyes on them. That first day, happened to be a Sunday, and Jeff Koons himself was speaking about his work in the Grace Rainey Rogers Auditorium as part of the Sundays at the Met program. Those sculptures mesmerized me with their huge scale, their bright colors and their distorting reflectiveness. I must have visited them a half dozen times over the summer, and was sad to see them go in October. I guess I'll just have to wait for Koons' next project: A life-size train dangling from a crane, set to welcome visitors at the entrance of LACMA (near my hometown of Pasadena, CA). I wasn't able to get to the Met today, since I was working a double shift at my restaurant today — and I was actually sad not to go, especially with the museum being closed tomorrow... but a girl's gotta take a day or two off! 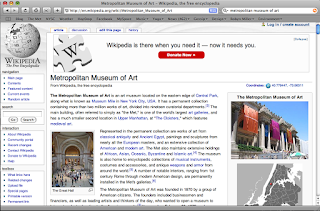 I can't just post nothing, so here is the wikipedia entry on the Metropolitan Museum of Art. It's HUGE. Then it was on to the Giorgio Morandi exhibition and the Robert Lehman Collection. I wasn't particularly taken with Morandi's work, save for a few jewels that stood out against his mostly earth-toned, muted still-lifes. His limited palette and geometric subject matter show his meticulous attention to composition and form. I can appreciate his experimentation with impressionism and cubism — sometimes emulating his contemporary, Paul Cézanne, sometimes breaking convention and further abstracting his geometric subjects, and always playing with the interplay between objects, foreground and background. For every ten still-life paintings, there was a landscape, or a self-portrait that drew me in — and there was one painting: Roses, 1917, which won my favoritism. 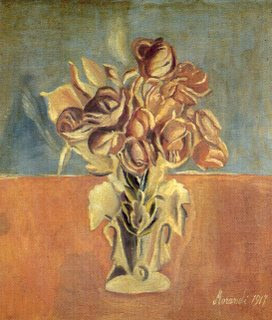 It was a study of positive/negative contrast between the pink roses and the gray background in the upper half and the gray vase and pink table in the lower half. I enjoyed the limited palette of this painting, and its departure from Morandi's browns, beiges and greens that filled his other canvases. Next, I ascended the staircase to the main level of the Lehman wing and stopped opposite the entrance by the railing overlooking the atrium below. I noticed that the facing wall, on the East end of the wing, was the same original brick exterior façade I saw in Petrie Court earlier this week... Standing there, taking in the building itself, I experienced a pleasant moment: I looked up and listened to the rain tip-tap the glass ceiling above, while the fountain in the atrium trickled and gurgled below. I turned around and absorbed the colorful Impressionist works of Gaughin, Van Gogh and Chagall, among others — a nice contrast to the grays and beiges of Morandi's work below. Though I was running out of time, I had to at least walk through the wing, since I hadn't been before. The small spaces made the gallery seem like rooms in a home (as was the architect's purpose I'm sure). 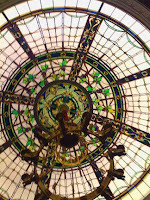 The second room was illuminated from above, and there I discovered a beautiful Tiffany dome, which had originally been installed at the Lehman mansion above the sixth floor landing (oh, just imagine living such a luxurious life!) 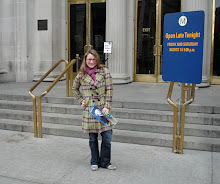 So it was with every intention of returning that I left the Lehman wing and headed off to work. Today's was a short visit — I just popped in to see a members-only preview of Art and Love in Renaissance Italy. Forgot the camera today, but it didn't really matter since I don't think photography is allowed in special exhibitions. Because I didn't have much time, I focused mostly on appreciating the exhibit design. I will surely revisit this gallery to examine the work its meaning, but for now I will write about my sensory experience. "Amor Vole Fe" — Love Needs Faith. The breath of your sighs. As long as you will be faithful to me." Sigh... why hasn't this kind of Romance continued into today's society? On my second day at the Met, a solo visit, I decided to take a "Museum Highlights" tour — to better acquaint myself with the museum as a whole, and because I haven't been on one of the tours before. We started off in the Greek and Roman Sculpture galleries and then covered the Arts of Africa, Oceania and Australia, followed by Modern Art, European Decorative Arts, and finally European Painting. The tour provided new information about works I had seen but didn't know much about and also pointed out several I hadn't previously focused on. The most interesting objects were Slit Drums from Melanesia (pictured far left, below). These are some of the largest musical instruments in the world, 10-15 feet tall by my estimate. They are traditionally used to communicate between tribes across miles of land and sometimes sea. I had seen them before, but didn't take the time to read about them and discover their remarkable purpose! 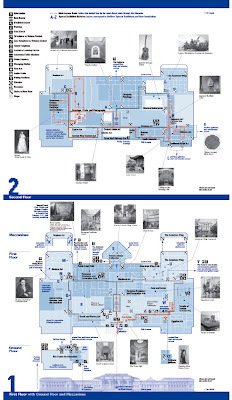 I even came across places in the museum I hadn't been to before. Our tour guide pointed out that the south wall of Petrie Court was actually the original exterior of the building before the museum's first expansion shortly after it opened. The facing wall was intended to complement the arches and brick façade and to serve as a background for European sculpture. Its simpler but elegant style is modeled after the Palace at Versailles, according to the tour guide. I look forward to the day that I have become familiar with every square foot of the museum — this will take a while, I know, especially with new exhibitions and renovations in progress — but for now, it is always exciting to see more works and a new corner of the museum.